Juniper – popular varieties, reproduction, growing, care, photo and video. Composition with juniper, located near an artificial pond. Juniper was known and popular in Rome and Ancient Greece, in those days it was used, as a remedy against snake. Avicenna used the crushed fruits of the plant as powder from putrid ulcers. North American Indians, especially not philosophizing, sent their compatriots in the juniper bushes for the treatment of tuberculosis. In the Northern latitudes coniferous breeds occupy a special place. In the offseason, and the bitter cold they enliven the garden landscape due to the rich hues of the needles, ranging from silver-gray and dark green to green-gold. Juniper is no exception, they complement the all-season garden, which looks interesting and attractive at any time of the year. The process of planting and caring for this plant difficult, horticultural nuances allow to grow high-ornamental tree. Variety expands the possibilities of landscape design. The original garden can be formed from only one of the conifers, it will be bright and original. The style of planting: regular or landscape, classic or avant-garde, modernist or ethnic will reflect the personality of the owners garden. The juniper on the site. 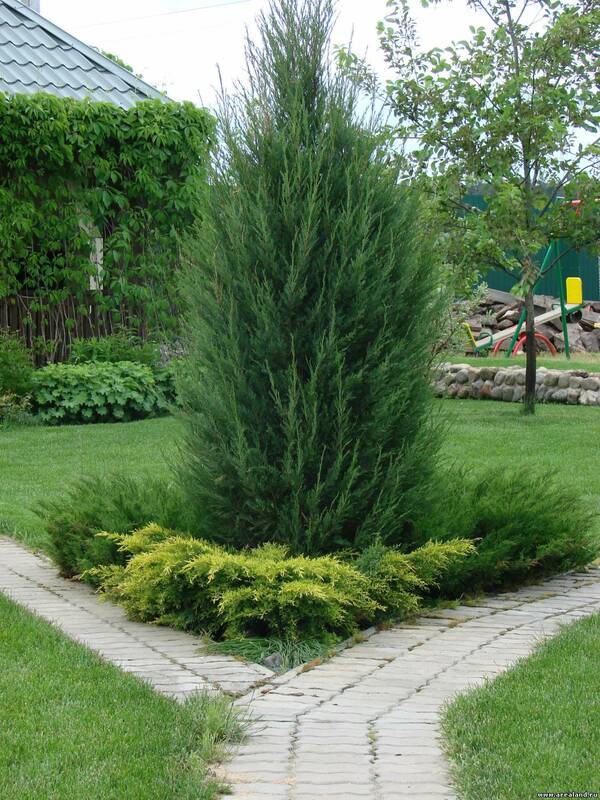 Conifers create an elegant and peaceful landscape. Large plants columnar or conical form, good in group or single planting, they become the center of the composition, dominant, which it is desirable to surround the small cultures. Junipers geometric shapes create specific points and emphasize the outlines of the flower. Spherical bushes well coexist with perennials. Spreading varieties will give the rock garden or pond expressiveness. They are often used to form hedges, for the design of perennial borders and rock gardens, to contour and underscore lawns. 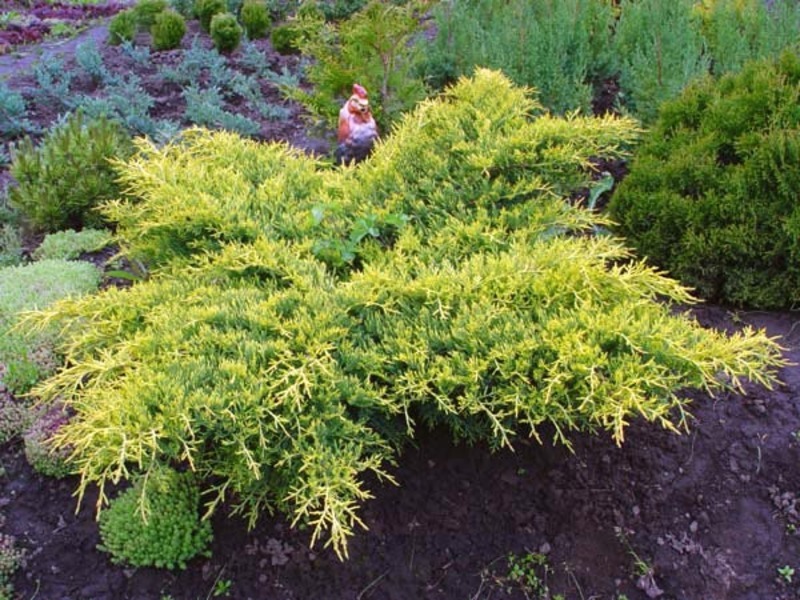 Small junipers indispensable while planting East garden – they are beneficial to beautify the stony composition and track, well combined with low-growing and ground cover plants: verbanica and carnations, the saxifrage and sedums, grasses and Phlox. Beautiful, spectacular crown of a juniper does not require frequent pruning, only varieties, planted in a hedge, it is often necessary to form. They are sheared in the spring and mid-summer, time to remove dry and lateral branches. If the plant is prepared for the role of bonsai, the cut is produced in April or may and in autumn, in October and November. When choosing varieties it is necessary to have information about the characteristics of this plant: size in the adult form, hardiness, the color and shape of the crown, conditions of care and cultivation. After purchasing and planting the tree experienced growers recommend to hide it in the first winter with burlap or spruce branches, branch tie back, to avoid sunburn and damage to the crown during the snowfall. it is recommended to choose plants, which did not grow in the open ground. Trees with exposed roots are planted exceptionally early spring or fall, and seedlings to the ground – during the entire period, from spring to autumn. In Northern areas, spring planting is preferable. "Meyer". 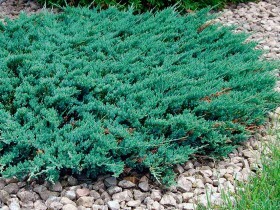 Used for mixed borders and bonsai, the needles are silvery-blue, height – to 1 m.
"Blue Carpet". The creeping crown, branched, fir – needles are silvery-blue, grows fast, used for the bottom layer of the landscape compositions. "Old Gold". Wide crown, rounded shape, needles color – yellow-green. The grade look good in single planting in rock gardens or on the lawn. "Gold Star". 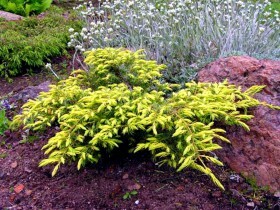 Low shrub, crown spreading, needles are Golden – green. The plant is used for creating low hedges, for decorating gutters and wells. "Mint Julep". Crown spreading, branches curved, green needles scaly. Juniper is good in group plantings, in the Alpine coaster, at the foot of high shrubs. "Pfitzeriana Compact". Needle-shaped green needles, branchy crown. The bushes tolerate a haircut. Used for planting of clumps and borders of conifers of different colors, cake hedges, planting of lower layer in a large landscape compositions. "Hetz". 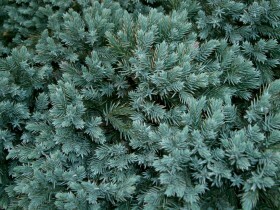 Crown rounded, spreading, fir – needles are silvery-blue. Tolerates shearing, used for single and group planting. "Canaertii". Crown columnar, needles – dark green. Can be planted in hedges, group, specimen. "Grey Owl". Fir – needles are silvery-blue, scaly, shoots purple, crown spreading. Used to form compositions. "Blue Spike". 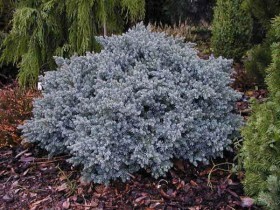 Undersized, dwarf shrub, needles – needle-like, glaucous-blue. 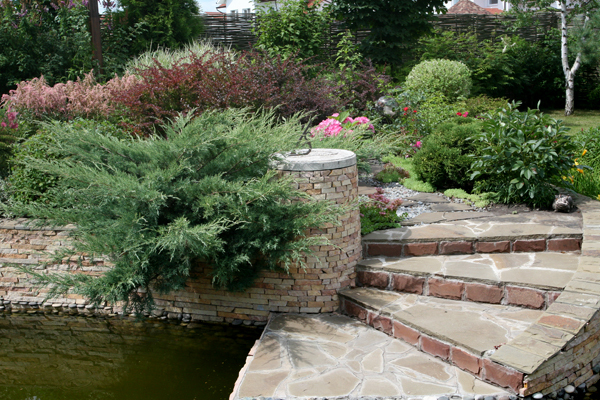 Used for rock gardens, design of retaining walls. "Blue Forest". Groundcover, creeping crown, needles – blue. Container planting, the lower tiers of the rock garden, strengthening of the slopes. "Andorra Compact". The needles are blue-gray, scaly, crown cushion. For decorating the slopes, low curbs. "Wilton". Groundcover crown, needles – silver-emerald. For large groups, lawns, rock gardens. "Strikta". Crown konusovidnoj, needles – blue-green. For growing in pots for group plantings. "Obelisk". Crown columnar, needles bluish-green. "Kuriwao Gold". Fishnet, branchy crown, needles – green, young shoots Golden. For single plantings and groups, rock gardens. 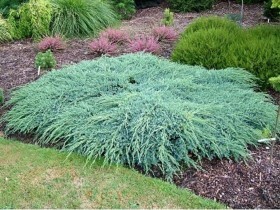 The conifers is a good choice for a young garden. A group of several plants is able to quickly fill voids and form an interesting composition. Light-loving varieties are planted in open areas with sandy or loamy soil, hydrated and nutritious. Heavy, clay soil can be improved, if you add to the hole a mixture of peat, garden soil, pine land and sand. Soil with coniferous needles of spruce and pine harvested in the woods. The necessary drainage of sand or broken bricks. 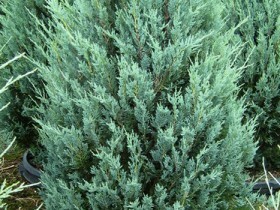 Junipers can grow in poor soils, tolerate drought, but do not like waterlogging. A good mixture for planting plants: two parts sod land, peat, humus, one part sand. You can add fertilizer, nitrophosphate for each seedling. The sizes of the holes depend on the size of the rhizome. For large seedlings are digging a pit 60 on 80 cm. To plant the plant should quickly, but be careful, so as not to damage young roots. After planting the juniper watered and shade from direct sunlight. How densely the trees are located in the area – depends on the intended landscape composition. The distance selected in the range from half to two. If the garden is small, compact, it is best to choose a small, compact varieties. Not quite ripened seeds best to collect in late summer, in the fall. The probability of germination will be higher. The collected material is immediately seeded, it will germinate in two to three years after planting. You can transplant the tree, excavated in the woods. 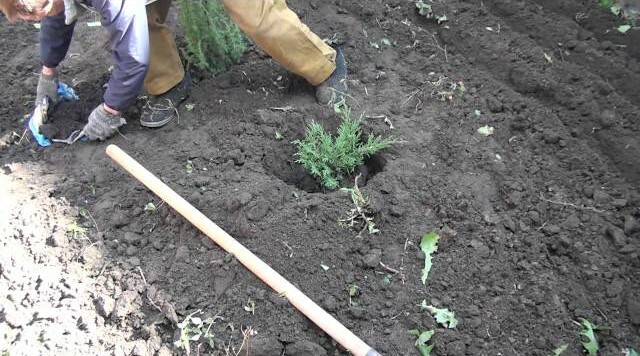 To better plant has taken root, it is necessary to keep its orientation to the cardinal points and dig up a seedling with a large lump of earth. 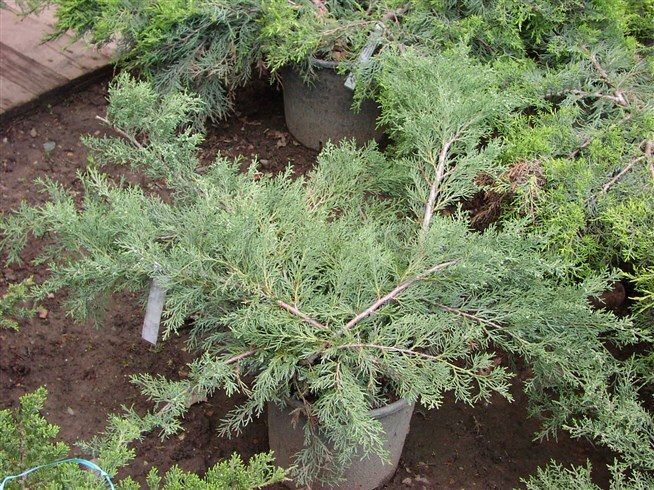 When selecting cultivars, plant care is minimal: junipers rarely damaged by pests, almost sick, do not require frequent fertilizing and spraying. Enough to provide watering in dry weather and two to three times per season to maintain landing complex fertilizers. It is impossible to fertilize conifers cow or bird droppings – from the roots of juniper burn, the plant may die. You also cannot loosen the soil around the stem – root system is close to the surface, food may deteriorate. Enough to mulch the soil with pine land, collected in the forest. In winter the crown of juniper can disintegrate under the snow, and weak branches to break off. To avoid such troubles, crown of autumn tied. Some plant species are sensitive to spring temperature changes and the active sun, they require shelter in February and March. Sunburn change the color of the needles, juniper loses decorative. If the kidneys is still alive, they will grow back and cover the damaged area, if you killed the branches must be cut to healthy wood layer and treating wounds garden pitch. to use snow. This is a good option for creeping and miniature forms. During heavy snowfall it is better to make a protective frame. You can fix the tiers of spruce branches, moving from the bottom up. Conifers are wrapped with a spunbond, Kraft paper in two layers, burlap, cotton fabric white color. All kinds of cover tied with rope, the lower part of the crown is left open. You cannot use film materials – the plant will rot. You can set the screen from the sunlit side of the plant. To shelter good use of metalized insulation, used for laminate flooring. In October, around the tree are driven pegs, and the pad itself, the plant is wrapped in November. Prone burns subspecies of Juniperus. The most common disease of juniper is rust. The threat is spider mites, juniper mole, aphids and scale insects. Against moths plant sprayed with decis, against aphids – fitofarm, scale afraid Malathion, and spider mites drug called "Karate". To stop the development of rust can solution arteria, spray four times at intervals of ten days. 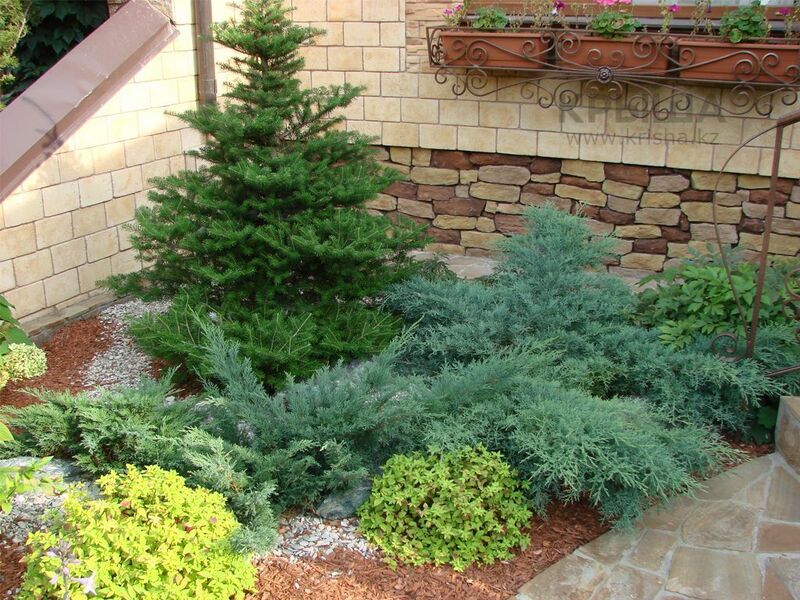 A variety of shapes and colors of juniper allows you to create original landscape compositions in combination with other conifers, deciduous shrubs, trees and flowers. All content on this site SamDizajner.ru written specifically for Simdesigner, copying 1 in 1 strictly prohibited. Reprint, full or partial rewriting of the article “Juniper – a reminder of summer”, possible, only when you specify the full, active link to the source.